The last two days have been a wild ride between allegations of Tristan Thompson cheating on Khloé Kardashian and the mom-to-be giving birth to a baby girl just hours later. There's a Category 5 hurricane of rumors swirling around about the situation, and it looks like they've spread to Kourtney Kardashian and her boyfriend, as well. Kourtney has been dating model Younes Bendjima since December of 2016. The two met at Paris Fashion Week that same year. Younes is 14 years younger than Kourtney, but the age difference doesn't seem to have affected the strength of their relationship. Recently, however, The Daily Mail posted a story that could have potentially caused an upset between the two. "Younes Bendjima enjoys another night out with two mystery ladies for a sushi dinner in Beverly Hills," wrote The Daily Mail in their story headline. The outlet then shared photos of Younes hugging one woman and walking with another. But Younes would have none of this! 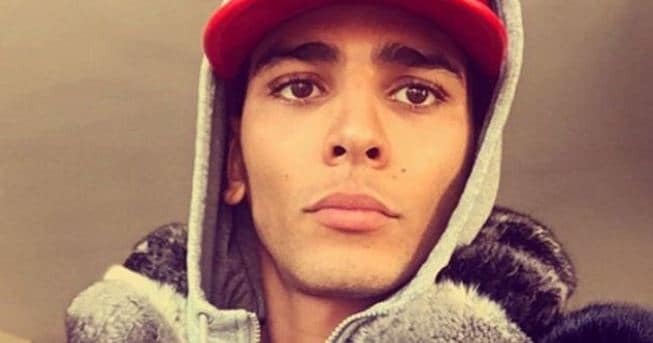 Clearly frustrated by the Daily Mail's accusations, Younes screenshotted the story and posted it to his Instagram story. "Daily Mail aka Daily Bulls*** where are the 6 other mens i was with?," wrote Younes in the caption, "What you guys tryna do? Nice cut tho you piece of s***." So, yeah, he wasn't too happy. Apparently, there were six other dudes that The Daily Mail conveniently left out of the narrative. Younes also received support for firing back at the publication. Shippers of Kourtney and Younes' relationship weren't here for the lies, either. There's already a trillion rumors circulating about the Kardashian family right now, and nobody — not the Kardashians themselves and not the public — need any more.